The Ayn Rand Society mourns the loss of Allan Gotthelf who was a founding member of the Society and held its highest office from 1990 (when he took over from the late George Walsh) until his death on August 30, 2013. As a way of remembering Allan and the lessons he taught us, we present an epilogue intended for his book On Ayn Rand (Wadsworth, 2000) in which he speaks about the role in his own life of the philosophy that he did so much to promote. The epilogue was cut from the book because of space constraints and is being published here for the first time. My first exposure to Ayn Rand was in reading Atlas Shrugged, at age 18. The novel’s effect on me was powerful and wide-ranging. I could not put all of it into words for some time, but I was aware immediately of several things. Whenever I thought of the book, it was as if one word stood before me, with a glow all around it: “Mind.” The book said to me that the mind is important to and in life. I had always had a good mind as a child, and had loved learning and understanding things. But for me that was something private, and I didn’t fully understand that the use of one’s mind was something practical, that could guide one in living, and in understanding oneself and others; and I felt I didn’t know exactly how one could use one’s mind to achieve one’s happiness. I was deeply optimistic, and felt that happiness was to be expected in life, that it was off there somewhere, but I didn’t know how exactly to find it. Atlas Shrugged said that the mind I valued in myself was not only a private source of pleasure but was also the means to everything I wanted out of life. I felt about the heroes of the novel that this is the way they felt about themselves and the way they lived and loved their lives was the way I wanted to feel about myself and live and love my life. This was the happiness I was looking for. There was one more thing that struck me almost immediately. I had always felt that my own happiness was and should be my primary concern in life; and I had always believed that one should respect the rights of others, and not use them as means to one’s own ends. More than that, I had felt very deeply that I wanted to live together in some fundamental harmony with other human beings, as we each pursued our own goals and our own happiness. But I had thought, or maybe just assumed, that these two beliefs were in conflict—that one couldn’t at the same time, fully pursue one’s own happiness and fully respect the rights of, and live in fundamental harmony with, others. Atlas Shrugged just blew that sense of conflict out of my mind. Atlas showed that these beliefs were not at all in conflict. It showed both that holding one’s happiness as one’s highest value is profoundly morally right, and that it is when and only when human beings each pursue their own happiness rationally, “neither sacrificing themselves to others nor others to themselves,” that harmony among men is not only possible but inevitable. These themes and much more from Ayn Rand have remained with me ever since. The thesis of the power and supreme value of the human mind has been a sort of banner to me in my work and life, and I have treasured one passage (among others) in Ayn Rand’s writings that flies that banner, which I would like to quote here. I will ask you to project the look on a child’s face when he grasps the answer to some problem he has been striving to understand. It is a radiant look of joy, of liberation, almost of triumph, which is unself-conscious, yet self-assertive, and its radiance seems to spread in two directions: outward, as an illumination of the world—inward, as the first spark of what is to become the fire of an earned pride. If you have seen this look, or experienced it, you know that if there is such a concept as “sacred”—meaning: the best, the highest possible to man—this look is the sacred, the not-to-be-betrayed, the not-to-be-sacrificed for anything or anyone. This look is not confined to children. Comic-strip artists are in the habit of representing it by means of a light bulb flashing on, above the head of a character who has suddenly grasped an idea. In simple primitive terms, this is an appropriate symbol: an idea is a light turned on in a man’s soul. It is the steady, confident reflection of that light that you look for in the faces of adults—particularly of those to whom you entrust your most precious values. You look for it in the eyes of a surgeon performing an operation on the body of a loved one; you look for it in the face of a pilot at the controls of the plane in which you are flying; and, if you are consistent, you look for it in the person of the man or woman you marry. In the name of the best within you, do not sacrifice the world to those who are its worst. In the name of the values that keep you alive, do not let your vision of man be distorted by the ugly, the cowardly, the mindless in those who have never achieved his title. Do not lose your knowledge that man’s proper estate is an upright posture, an intransigent mind, and a step that travels unlimited roads. Do not let your fire go out, spark by irreplaceable spark, in the hopeless swamps of the approximate, the not-quite, the not-yet, the not-at-all. Do not let the hero in your soul perish, in lonely frustration for the life you deserved, but have never been able to reach. Check your road and the nature of your battle. The world you desired can be won, it exists, it is real, it is possible it’s yours. This is some of what Ayn Rand has meant to me, and in this book I have sought to convey the philosophical basis of these themes and this vision. Many years ago, a young woman who knew of, but did not share, my love of Ayn Rand told me that if I liked Ayn Rand’s works, I would like Hermann Hesse’s Demian. I didn’t very much. But one line in that book moved me profoundly, and I have carried it with me to this day. The novel’s protagonist asks Demian’s mother how one can thank someone who has provided one with a depth of philosophical insight that can never be repaid. That is what I have tried to do in this book. 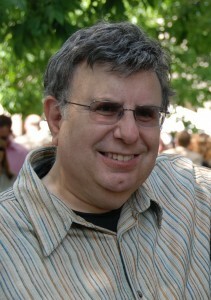 Allan passed on what he learned about the importance of man’s mind in many ways: in his 47 years of teaching, in his path-breaking research on Aristotelian philosophy and science, in his writings on Objectivism, in his wise leadership of this organization, and in the example he set of how to live and love one’s life. Readers interested in more information about Allan’s career can find an up-to-date copy of Allan’s CV, including posthumous works, here.